2016, 16, Isuzu, D-Max, 2.5TD (161bhp) Utah Huntsman Double Cab Pickup Manual gearbox, 6 speed, Double Cab Pickup, Diesel, 4 wheel drive permanent, 2499cc. Solid white with full black leather interior, One former keeper from new with 2 remote locking keys, Isuzu service history, 4 service stamps with the last service done 22/1/2019 at 59754 miles. 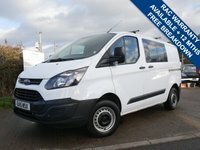 Vehicle comes with Air conditioning, DAB radio, CD player, Heated front seats, Power folding mirrors, Cruise control, Roll top back load cover with keys, On board computer, Multi function steering wheel, Side steps, Roof rails, Front fog lights and rear parking sensors. Isuzu warranty until 1/8/2021 Vehicle comes with 12 months MOT, service and 3 months parts and labour warranty. Extended warranty packages available from RAC Warranty, 3 months to 2 years available. High resolution images available by email, for further information please contact 01904 468514.